At Colonial Overhead Doors in Johnstown, in Central NY, we provide our customers with exceptional service and the best products on the market. We have extensive experience in the industry, and our team is highly qualified, and knows everything there is to know about the sales, installation and repair of garage doors and electric garage door openers. This is why we sell GARAGA garage doors and why we take the time to fully train our technicians. You can trust us for everything pertaining to your garage door. We’ll be able to quickly solve any problem you may have. 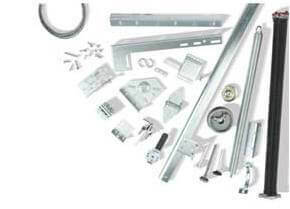 Your garage door will work perfectly and securely. NO PROBLEM is too difficult for us! Do you experience problems with your garage door opener? Do you experience problems with your garage door? No problem is too difficult for us! Entrust your garage door needs to us and we will solve them to your complete satisfaction. We are part of the Garaga Expert Network. Our technicians are certified; therefore, our services meet the highest standards of professionalism. Our staff will provide professional advice because we know our products perfectly. You can contact us online to schedule an appointment. We cover the areas of: Fulton, Montgomery, Saratoga, Saratoga Springs, Schenectady, Schoharie, Albany, Hamilton and Herkimer. We love our work and we pride ourselves on the services we offer. Therefore, you can completely trust us! Call us today! Springs (the counterweight system) lose their strength over time, and can even break due to normal wear caused by the pressure and weight of a garage door. Given the springs play an important role in the opening and closing movements of a garage door, they must be frequently maintained and/or repaired. For example, in order to extend the life of the springs (torsion-type only), you can apply motor oil to them and wipe off the excess. However, it is dangerous to adjust extension-type springs yourself, as they are maintained under high tension. This is why it is necessary to secure them using a security cable. If this is not the case, we strongly recommend that you have one installed by one of our experienced technicians. Also remember that if your garage door is equipped with extension or torsion springs, these two systems must be regularly inspected and maintained in order to ensure their reliability. For your peace of mind, take advantage of the Preventative Maintenance Program offered by our professionals at Colonial Overhead Doors. We will test all your security devices, replace only those that need to be replaced, and your garage door system will work perfectly! Michael and his team are available to answer all your questions, and don’t hesitate to contact us at 518-762-3671 for all your installation, repair and maintenance needs for your garage door.